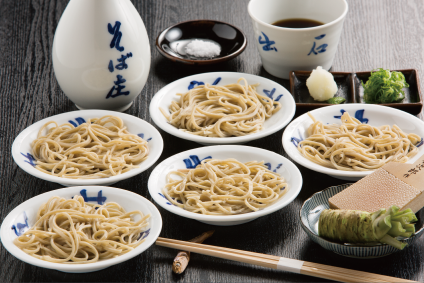 It is generally called Nihachi-soba (twenty percent wheat flour and eighty percent buckwheat flour). It is buckwheat noodles combining 2% of flour with 10% of blended buckwheat flour with natural sweetness that is made of stone milled husked buckwheat seeds. Izushisarasoba consists of a 5-dish set per person as it has been developed for enjoying as much as you wish without wasting anything and the people who are in the know of buckwheat noodles add on some green onions and pour the sauce directly on the dish. Now there are various condiments, however, so we serve fresh seasonal condiments to protect the original taste at our restaurant. These buckwheat noodles are made of flour made from stone-milled husked buckwheat seeds with endocarp. At Sobasho, we are making Chihiro soba that is unchanged buckwheat noodles made only of buckwheat flour. 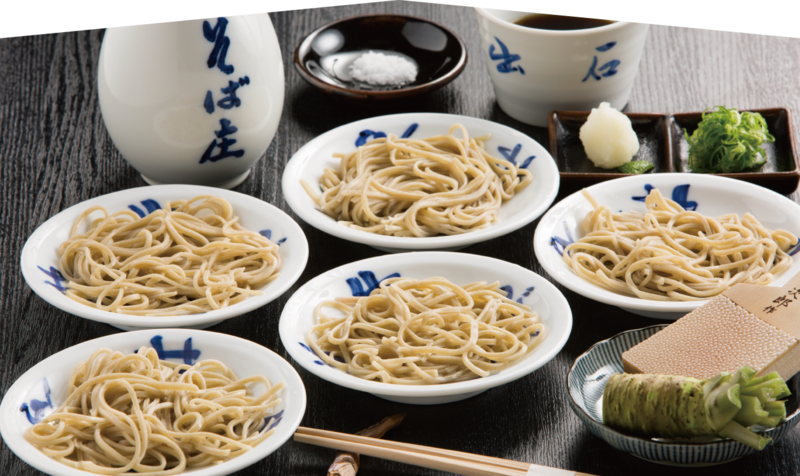 Shin soba that is grown by the environment of Tajima are buckwheat noodles we would like people to try at least once with various tastes that wasabi and water create. The difference of Chihiro soba is that it is made of 100% buckwheat flour and Izushisarasoba are such that the color and taste are that of buckwheat and condiments.